Amylulita says...: VIVA MEXICO CABRONES!!! 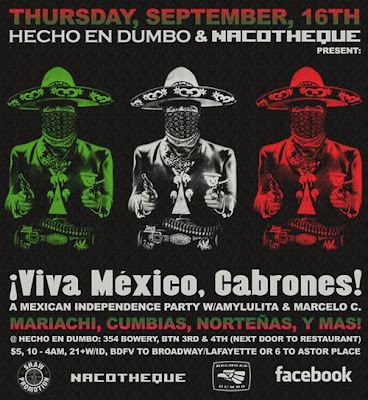 2nite Nacotheque celebrates Mexican Independence! VIVA MEXICO CABRONES!!! 2nite Nacotheque celebrates Mexican Independence! It's days like this that remind me where my blood comes from and makes me proud. Even tho my skin is pale my veins carry spicy Mexican blood from my daddy; Guillermo Meneses (R.I.P.). 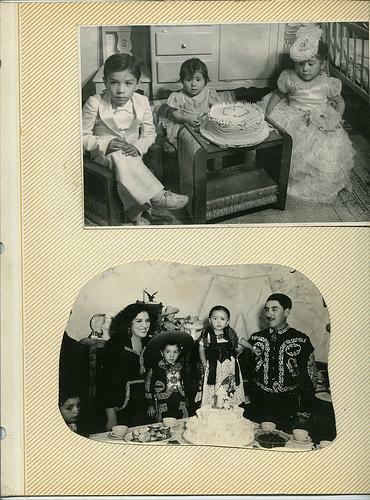 The foto to the left is of my daddy (the handsome little boy in all white) celebrating his sisters bday in Mexico. The foto below that is of my daddy with his parents and his little sister who looks like a beautiful little Mexican doll!! I remember sitting at my abuela's dinning room table in Mexico and contently eating sopa con sliced sausage. I was only 4yrs old but I can still remember walking through the market place and smelling freshly cooked street meat, roasted corn on the cob, and corn tortillas, MMMmmmm. I used to dance in my parents living room to Mexican music and dancing in circles arm in arm with my baby brother (I really don't know what I was listening to, but I can guess it was mostly Nortenas). Hysterically laughing up a storm til my face turned red and my heart beat a million miles per hour. Oh yes, Mexican runs through my veins and I'm proud of it! So tonight I'm happy to bring you the Nacotheque Mexican Independence party "Viva Mexico Cabrones"!!! I'm bringing spicy Mexican candies for everyone!! Spicy mexican dulces for everyone!!! The the Mexican "bicentenario" is here so let's celebrate cabrones!! it's the biggest Mexican celebration pretty much ever. basically the 4th of July for Mexico.